...rainy and gray. I am very much missing the sunny Florida days last week. ...about how in the world my first baby is now 8 years old? I had him on my 24th birthday, so you can do the math to see how old I am too. 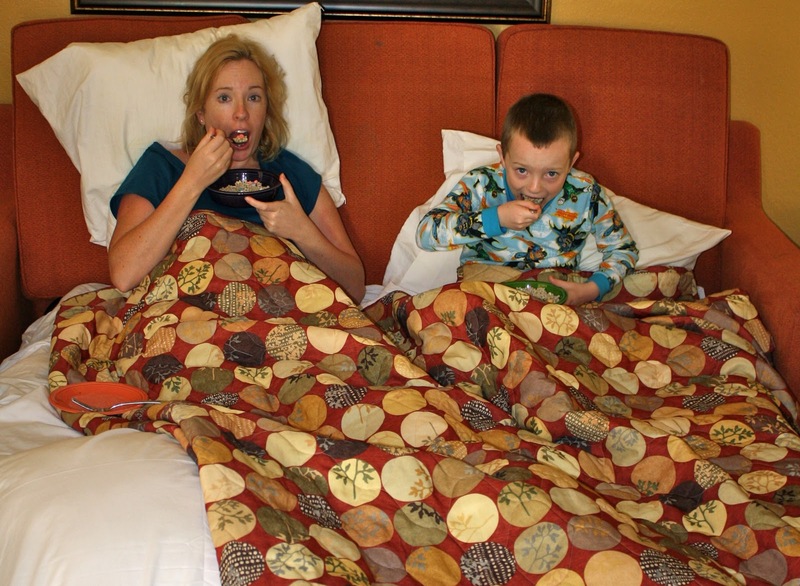 We celebrated our birthdays with breakfast in bed and ice cream at the airport. Phil's family had a cake for us On Saturday while we were in Maryland, and John-Paul will have another party this weekend with my side of the family. ...the menu for the week includes: roast chicken and mashed potatoes, ravioli, veggie burgers and salad, pizza, and chicken divan. ...to stop eating ice cream every day - geesh! ...nothing. I just read about St. Gianna, and I'm about to start a a book called Burst to review in the future. ...that although we are keeping this baby's gender a surprise, I will be able to tell what he/she is just from looking at the screen myself. Not likely, since I usually can't even differentiate between the head and the belly. ...country music on the radio. Why does it always make me cry? ...Phil ran around like a mad man when we arrived home yesterday and unpacked all our clothes. Then he went grocery shopping for the week with Maggie while I stayed home with the boys. I can not say enough wonderful things about my husband, and how helpful he is! Plus, he's a hottie...I mean how lucky can one girl get? ...blog friends. Sarah had her baby, and I feel as though I am missing out on not seeing her in real life, even though we've never even met IRL. Another blog friend, Lisa, is coming up to visit and go to the Mom's Day Away hosted by Faith and Family with me. I am so excited! ~Ultrasound on Wednesday and a dinner date with Phil afterward to my favorite restaurant. They give you a free meal and dessert to use on or around your birthday! ~A wake (Tues) and funeral (Wed) for my boss's father that passed away this weekend. ~A pool party for John-Paul and my niece, Katie's birthdays on Saturday. None, I have already posted a zillion vacation photos over the last couple days. 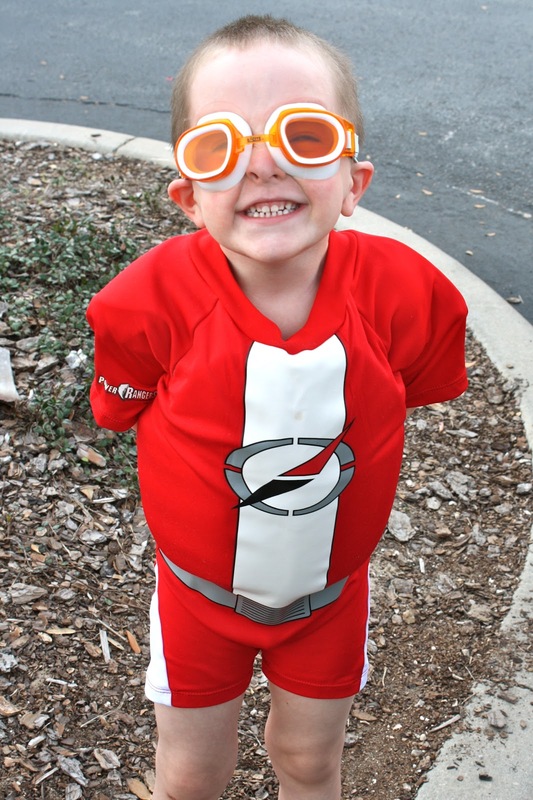 If you saw this little runt walking around by the pool, how could you not smile? The birthday buddies...breakfast in bed! Down time ~ watching tv before some MORE swimming. We swam every day except one. It was 85 and sunny each day. Thank You God! Driving home from the airport - sleepy heads. I got this sunburn on the last day in FL (of course!). My sister the dermatologist is so going to yell at me...sigh! We had such an awesome trip. We ate ice cream every day, swam and walked around a TON, and laughed together like crazy. There were a few meltdowns (ahem...Maggie) but overall the kids did extraordinarily well. 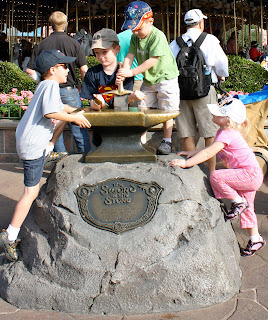 We are saving our money to go back in five years (hopefully!). This nice guy, working at the Buzz Lightyear ride, stopped to talk to Eamon who was wearing his new Buzz Lightyear hat from Gammy. He discovered that Eamon is a HUGE fan of Buzz Lightyear, and gave us a pass to come back anytime and skip the line. So Eamon got to go on his favorite ride three times! 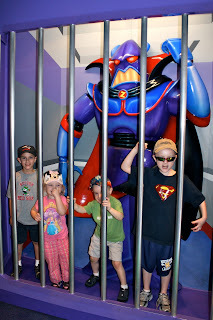 The boys thought their great laser skills on the ride were actually the reason the Zurg was imprisoned! So I have one bone to pick with Disney. Not only do you have to wait in line for rides (understandable) but you also have to wait in line to meet the characters. I think they should have the characters waiting by the rides with the long lines, so that halfway through the line-ride, you get to meet the character. Makes sense, right? Enjoying our tropical soft serve and pineapple floats..mmm! Eamon's Buzz Lightyear hat glows in the dark, so on every ride that went inside, he would take off his hat and look at it with pride. So cute! We happened to walk in front of the castle right before Mickey's show was going to start. It was awesome! A story: A little girl (about 3) lost her Mickey balloon when she got on the ferry. She was crying hysterically, and we all felt so sorry for her. The balloon flew off, but had a weight on the bottom of the string so it was dragging across the water and up onto the coast. A Disney worker jumped in his speedboat and raced off after it across the water and beached his boat, hopped off, and ran up the coast to catch it. He got it! Then he drove his boat to where we were getting off the ferry and gave it back to the little girl. Everyone on the ferry was watching the exciting chase scene, and cheering loudly for the heroic balloon catcher. It was great!